Understanding of the process of glass bead making and bead working will give you insight and respect into the cultural influences and the global spread of bead production. Traditionally, the most common techniques in bead making are winding and drawing. 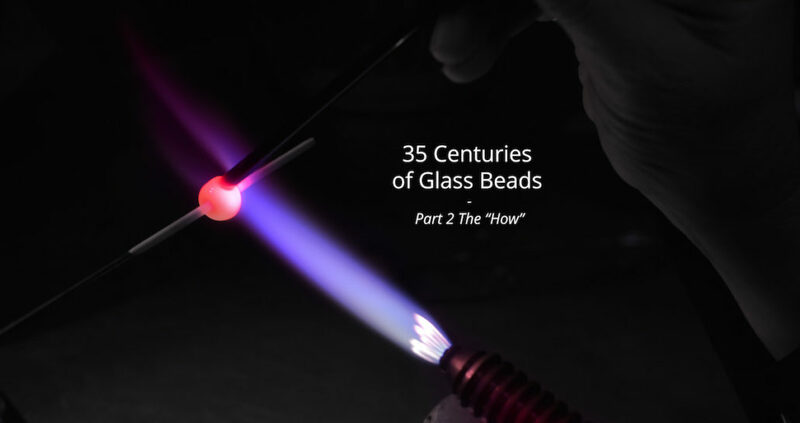 Twisting hot glass around a rod (called a mandrel) is the oldest and most common way to make a glass bead, dating back to the 2nd millennium BC. The first beads were made this way and several winding techniques are still in use today. Wound beads are produced by dipping a mandrel or rod of some material into hot glass and simply winding that around the rod. Furnace winding is when you dip an iron mandrel into glass then place it in a furnace. A peak is used to wind the glass around the mandrel after which the bead can be shaped or decorated. After its final heating, it can be knocked off the mandrel because iron cools faster than glass. Lamp winding incorporates heat generated by a small lamp, which allows for more complex decoration. Drawn glass represents the inception of industrial mass-produced beads. They’re made from cutting a tube of glass that’s been drawn or pulled. Drawn beads include the glass seed beads, which are small beads meant to be sewn on or woven into patterns. Nowadays, technology enables beads to be manufactured efficiently and with more consistency. Mold-pressing is common and expands the style and shapes of beads available, molds can be almost anything, and DIY bead-makers are discovering unique ways of creating beads using molds. Bead working started as a localized ancient art form and has spread throughout many regions. It continues to fulfill the roles of ornamenting clothing, representing aspects of spiritual ceremonies as well as continue to inspire completely new craft forms. An understanding of the formation of these distinctive objects shows both the similarities and differences in the production and use of beadwork around the world.